The Watersheds group is open to all members who promote responsible stewardship of the earth and hopes to promote the connection between our local actions and their affects on the regional and global communities. See you in the 'shed! Thanks! This group is dedicated to waterways everywhere! Please feel free to post Articles, Action Alerts, and Petitions. We support all environmental issues related to all waterway concerns from toxic pollutants, deforestation, to species endangerment. Thank you SHEDDYS !! Now a little bit about WATERSHEDS ! ! When looking at the location of rivers and the amount of streamflow in rivers, the key concept is the river's "watershed". What is a watershed? Easy, if you are standing on ground right now, just look down. You're standing, and everyone is standing, in a watershed. 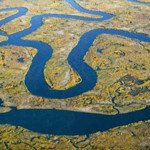 A watershed is the area of land where all of the water that falls in it and drains off of it goes into the same place. Watersheds can be as small as a footprint or large enough to encompass all the land that drains water into rivers that drain into Chesapeake Bay, where it enters the Atlantic Ocean. This map shows one set of watersheds in the continental United States; these are known as National 8-digit hydrologic units (watersheds).